Located in the northernmost region of Kul Tiras, Stormsong Valley is home to House Stormsong and the mystical tidesages. Wielding great power over the seas, the tidesages impart their blessings upon the mighty Kul Tiran fleet. Join us as we take you on a brief tour of Stormsong Valley. The lands of Stormsong Valley are lush with green grasses and rock-strewn rolling hills. Wildlife and plant growth thrive here, fed by the inland streams and the invigorating sea air. It is a region made rich by the harmony between both land and sea. As with any great mystery, you’ll need to find and follow the clues before you. Begin by taking a ferry to the Stormsong Monastery located in Boralus. Perhaps the sisters and brothers there will have more insight on the missing fleet. Thankfully, you won’t be alone for your journey. A ward of Harbormaster Cyrus Crestfall, your guide Taelia is a knowledgeable companion eager to help you get to the bottom of things in Stormsong Valley. The signs of the sea are everywhere in the monastery, but an itch between your shoulder blades feeds the impression that you’re unwelcome. Answers aren’t easy to come by and danger is lurking nearer than you think. The Kul Tiran fleet has been lost at sea. 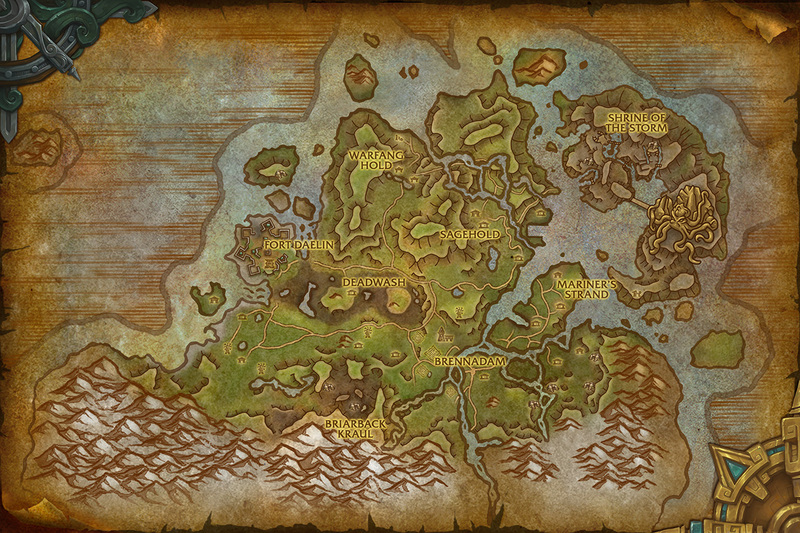 The tidesages of Stormsong may be our only hope to locate the fleet of legend. Word from someone within the resistance is that the fleet is not truly lost but trapped by dark forces. It will be up to you to find allies within Stormsong Valley to help you root out the heart of this conspiracy and bring the fleet home. Brother Pike from the town of Brennadam in the north is one such ally. You’ll need to meet with him to find out what more he knows of the challenges you’ll face. The Highland Pass is the only land route into Stormsong Valley, but a blockade halts passage between Brennadam and the rest of Kul Tiras. Once you find a way through, you’ll crest the pass to take in the breathtaking sight of the land stretched out before you. The reception you’ll receive in Brennadam isn’t a warm one despite the beauty of the surrounding town. The citizens are angry at the soldiers for seizing their harvests and failing to protect the people they are meant to serve. Brother Pike will help find the answers you seek, but each discovery is another knot in a skein that wends through this troubled land. There is more beneath the surface to be discovered, and you sense darkness waiting just out of sight. The further inland you go, the more apparent it becomes that the void’s corruption has burrowed deeply into the land, the wildlife, and its people. Those of able body (if not able mind) are either conscripted or manipulated into serving the tidesages and the malevolent will that commands them. Things to Try: A sip of Seaglide Elixir can be a great refreshment when battling void-corrupted creatures of the sea. It also gives you the ability to walk on water—for a little while. “It is said that tidesage magic allows Kul Tiran ships to glide effortlessly through the sea.” Try not to touch too many unfamiliar things unless you know what you’re getting into—though of course, the voices will insist there's nothing to fear. The Whispering Wavestaff giveth and taketh. But then again, what’s a little cost in health compared to laying out a little extra carnage? On the western coast, Fort Daelin is under siege by the naga. Brutes pummel the stone walls even as harpoons drive further into the walls above them. Without aid, the levee holding back the sea will plunge the fertile valley into the naga-infested depths. Emboldened by the soldiers neglecting their duties, vicious creatures have encroached on the noble people of Stormsong. Whether it’s ettin in Millstone Hamlet or the territorial quilboar, these threats will only grow more aggressive without someone to push them back. On an island to the northeast resides the seat of power for both House Stormsong and the tidesages: the Shrine of the Storm. Its very foundations are carved into the rocky outcroppings, and the sign of the kraken adorns its ancient structures. Shrine of the Storm Dungeon--Spoilers Inside! The Shrine of the Storm is a seat of power for both House Stormsong and the tidesages. Here, blessings upon the fleet are performed to ensure that the Kul Tiran fleet knows no equals in combat. Yet, a dark force has corrupted these sacred grounds and threatens to steal control of the Kul Tiran Fleet forever. Aqu’sirr – The deeps hide many powerful secrets lost to time. A master of these waters, Lord Stormsong calls upon one of these creatures of myth to defend the sacred shrine. Tidesage Council – Brother Ironhull and Galecaller Faye use their power to bless the Kul Tiran ships and ensure their fleet remains unmatched on the seas. Lord Stormsong – Master of House Stormsong, Lord Stormsong leads the tidesages in tehri oceanic blessigns and ways. However, not all is as it seems. . . .
Vol’zith the Whisperer – Sent by Queen Azshara to subvert the tidesages, Vol’zith whispers promises of power to those willing to listen. There’s a long road to take through this beautiful but treacherous land. 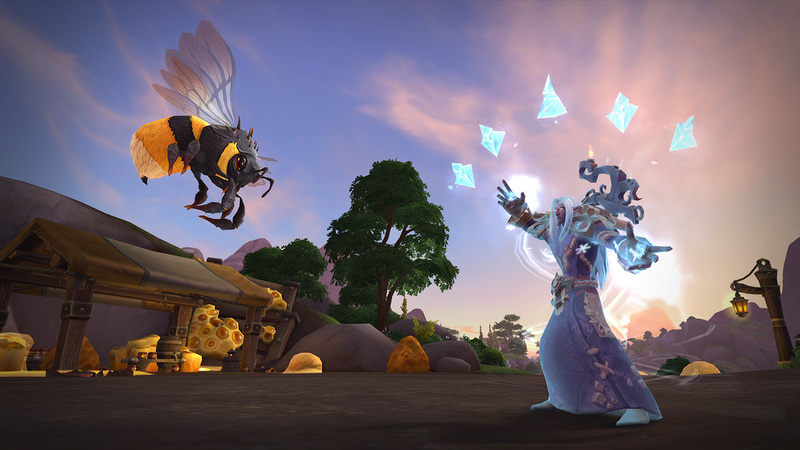 Bringing House Stormsong back into the fold and freeing the Kul Tiran fleet are paramount to defending the kingdom against the Horde's incursion. Those brave enough to explore Stormsong Valley's vast coastlines will meet a brave, noble people who embrace the land they live in and the bountiful sea they so love. When you’re ready to go beyond the lands of Stormsong Valley, the stygian hills of Drustvar await to the southwest, and to the southeast lies the capital of Kul Tiras, Tiragarde Sound.